Welcome to the website of the Brenton Blue Trust (BBT)! The BBT was established in 1997 during the widely publicised and supported campaign to save the Brenton Blue Butterfly. The campaign began in 1994 and continued until a Special Nature Reserve (SNR) was proclaimed by National Government in 2003. The BBT brought together all the key role players interested in saving the butterfly, including prominent NGOs such as the Lepidopterists’ Society of Africa (LSA), the Endangered Wildlife Trust (EWT), the Wildlife & Environment Society of South Africa (WESSA) as well as governmental organisations such as CapeNature (CN). The SNR was managed by successful implementation of a scientifically based Environmental Management Plan (Edge, 2008), and the Brenton Blue’s future seemed secure. 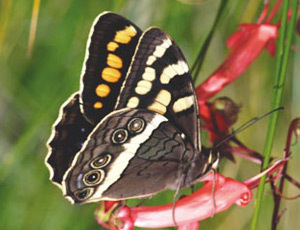 The BBT then turned its attention to other endangered butterflies in South Africa, to fulfill its broader objectives of promoting Lepidoptera conservation. Meanwhile, following completion of the South African Butterfly Conservation Assessment (SABCA) project in 2012, LSA had decided to launch a new conservation programme known as COREL. LSA therefore approached the BBT in 2012 with a proposal that the BBT fund the COREL programme with LSA as their implementing agency, and this was accepted by the Trustees. This would enable the success of the Brenton Blue conservation project to be a “blueprint” for the conservation of other Lepidoptera (butterfly and moth) species. It is obvious to most people that our world would be a much poorer place without butterflies. However, apart from their beauty and the joy they bring to adults and children alike, there are important ecological reasons for saving them from extinction. 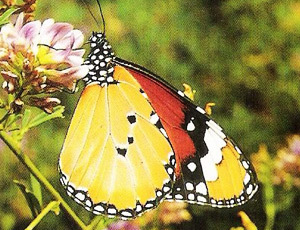 Butterflies are an integral part of the natural ecology and many other species depend on them for survival. Butterflies help to pollinate flowering plants and are prey for a wide variety of predators, such as spiders, birds and lizards. A number of butterfly species have complex relationships with other insects, such as ants, which protect and feed their larvae, in return for a sweet honeydew-like substance, which the butterfly larva secretes. Butterflies are frequently used as indicators of community or habitat health. 95% of the species on Earth are invertebrates and it is critical that we maintain their diversity. Butterfly diversity is a good representative of the invertebrate class of animals. Butterflies are the subject of detailed scientific investigations, helping us to learn more about biology and ecology in general. For example, butterfly studies provide us with valuable evidence about global warming and its effects on our natural surroundings. A wide variety of human art forms, such as painting, poetry and literature, draw their inspiration from nature, with butterflies being one of the most eye-catching, charismatic animals. Even music and theatre have incorporated the iconic beauty of butterflies, for example Vladimir Nabokov’s symphonies. The uplifting effects of the beauty of butterflies on the human psyche are well-documented.